Remember Baby It's Cold Outside... Inside Too!!! ? For awhile - The Boiler which heats the water that then circulates throughout the house's radiator system has been making thumping noises. We thought it was air in the radiators which had to be released. Wrong!!! Tuesday night - The Boiler gave up the ghost. Oops, we thought it was a pump which pushed the hot water through the pipes because certain radiators were not getting any hot water/heat. Wrong again!!! 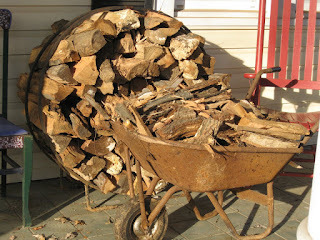 Wednesday morning - Called for delivery of a Cord of firewood to be delivered same morning. Very cool. 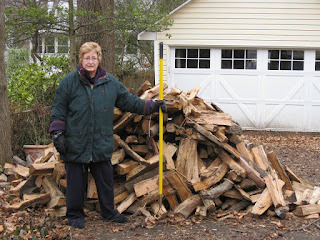 For those who aren't familiar with what a Cord of word is, it is 128 cubic feet of wood, 8ft x 4ft x 4ft. 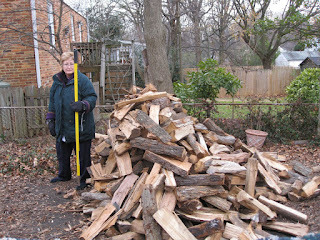 That's A LOT of wood to burn in the wood stove (fireplace) in the livingroom of this old house. Wednesday evening - Finally, a plumber who deals with Boiler/Radiant Heat came to assess the necessary repairs. Turns out that a part which controls filling the water tank and maintaining the required water levels had gone out. Very bad!!! It is a part which must be ordered (rush please) and installed. Then we hope that while it was malfunctioning further damage was not done to more of the system. Yikes! 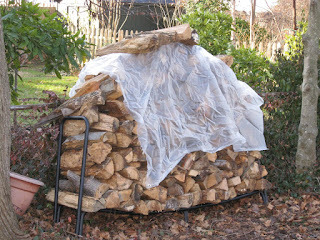 It took us almost five hours to stack the wood. It was dark by the time we finished so no immediately after photos. Sorry. Friday morning - I look out the window from upstairs and could almost cry (if I weren't so damn exhausted, and sore, and really walking funny, etc.). The ground was a little too soft for our liking and we had placed the feet of the rack on some bricks so that it would not sink and lean. Ha! I guess the joke's on us. This rack which measured 8ft x 4ft fell over during the night and spilled half of our supply of wood. I'm really unhappy about this turn of events. 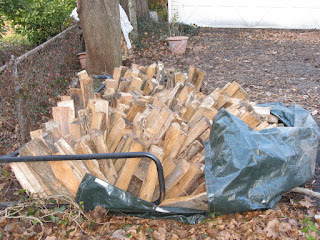 So here's some photos of our various stacks of wood. What didn't fit in one of these is located in the garage. Did I mention that I'm more than tired? Not to brag or anything but we have yet to turn on our heater... although it's usually our A/C that goes out on the hottest day of the year. Tag, you're it if you want to participate. Hope things look up for you soon. I feel for you Lisa. My furnace conked out last year on a -20 C Sunday night. When it's that cold you'll pay anything to get things fixed. I recall hearing that old clunking sound in those radiant heaters in the past. Hopefully that cord of wood will get you through for a little while. We had a wood burning stove in our home growing up and it put off some good heat - if you were within a few rooms of it. Best of luck! Oh Geesh, when it rains it pours! And wouldn't it figure that the heater would break when it starts to get cold! We have a furnace but we need to buy oil for it. The first winter we were here, we thought that the oil lasted longer than it did and I came home from a shopping trip to a frigid house! I had to have an "Emergency Oil Delivery" which was right arm expensive and the guy showed up in his long john underwear and work boots. And I'm a firm believer in the "Laugh so you don't cry" philosophy but there's only so much to laugh at before I end up curled up in a ball in the corner bawling my eyes out! I hope you're somehow staying warm! And I had just been thinking about how simple our old radiator heat was, ugh. Good luck my cold friend. Let's gang up on Miss Chris and get heated up. LOL PS--your Mom is a cutie pie.